Order a Gift Certificate today! As a gift or for yourself. 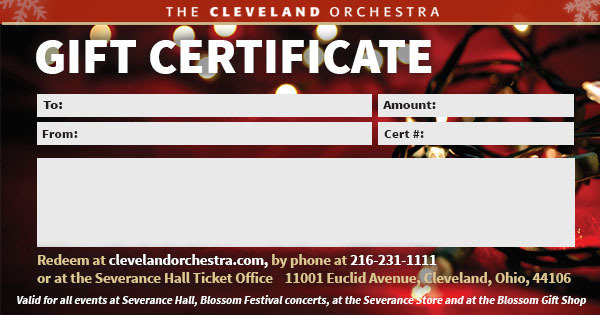 Gift Certificates can be used to purchase tickets to performances at Severance Hall or to each summer's Blossom Music Festival, or for merchandise at the Cleveland Orchestra Store in Severance Hall. As a new option, Gift Certificates can now be delivered directly by email and printed at home. You can use the "Recipient's Email" field below to have your gift delivered directly to their email. Or skip that field and choose delivery method (1st Class Mail, Hold for Pick-Up, and Print-at-Home) when paying for your order to have it delivered to you. Perfect for that last-minute gift! $48.00 Buys 2 lawn seats for most Blossom performances. 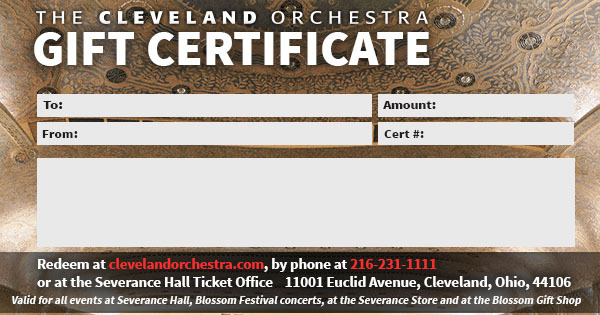 $58.00 Buys 2 seats to a Severance Hall Classical concert. $118.00 2 Seats in Center Orchestra for most performances. $178.00 2 Seats in the Dress Circle for most performances. $596.00 Buy a Box! 4 box seats for most performances.